Met TheMightyVoice on the forums, I don't even know why I keep playing this game. Nobody knows why they keep playing. I cast blessing. Thread revived. I've been working on a project over the past few days to rebuild ALL of my frames to accommodate max rank prime mods and corrupted mods that I kept putting off leveling up. At this point none of my frames except Equinox and Nekros are able to fit most of the fully upgraded mods I'll be finishing. Because of this, I have to forma 26 of my current 28 frames (excluding the only two I don't own; Hydroid and Vauban Prime). While I'm doing this I'm also using Warframe Builder to redo all of my most commonly used builds for each frame. I figured since I put so much time into filling out the builder I might as well share these builds with anyone who happens to pass by Symthic and plays Warframe. So for now I'm dumping builds for the frames I intend to use after leveling up all of these mods, some of my frames will sit for a while before getting updated. These builds may not necessarily be what the community thinks are meta, or what youtubers like to run, but they perform the role that I intend the frame to perform, so if these don't agree with what you run, keep that in mind. Also, if anyone happens to find any glaring errors in how I've set up some of my mods please point them out, there happened to be an error like that in my Excal build which has since been fixed. I think that's 17 frames, the others have been cast off into limbo(heh) until I can bring myself to spam more forma. Exacl: Assuming that's an EB build, drop Blind Rage for Energy Conversion (the bonus strength snapshots when you cast). That gives you enough efficiency to drop Constitution for whatever else you want. Ember: Why are you slapping so much duration on her? Also, Energy Conversion > Intensify. Equinox: Peaceful Provocation is FAR better than Power Drift. It'll only give you 10% str on your build instead of Drift's 15% but the Pacify debuff is insane. Also, Energy Conversion > Intensify. Mirage: I'd recommend Hall of Malevolence over Power Drift, 50% more clone damage is pretty strong. Hell, Energy Conversion is better than PDrift if you put in the forma. Nekros: Your build has a lot of R0 mods on Warframe Builder, dunno why. Health Conversion is dope with Despoil, gives you an 80% damage reduction from the bonus armor. That setup has gone totally under the radar and I'd highly recommend thinking about it. Not many people know that that mod exists. Nova: MP's slow maxes out with 45% strength, TFort isn't necessary unless you're building for Maximum OverTorgue. I don't get your Rhino build at all. No range so Stomp doesn't do anything and Roar isn't good enough for groups. All that's left is Iron Skin which doesn't scale with duration so there's no real reason to mod duration at all. You'd get more Iron Skin health from TFort than from Armored Agility and you're missing Iron Shrapnel which is a dope as hell mod (turn off Iron Skin and reset out of combat). I have answers for most of those, and a lot of them start with the fact that I like having mostly balanced frames that can use a majority of their abilties. Excal: This build is largely the same as what I've always used. I want to keep the duration and range (range used to be a dump stat) so that I can make use of Radial Blind. I don't think it needs any more power strength because it's already over 10% more than I currently run, and this build is capable of over 250k damage on EB swings when conditions are ideal (headshot, proper element, Naramon invis proc, crit), keeping my Radial Blind in a state that gives it some functionality gives me access to finisher damage I wouldn't otherwise have. Mesa: Straight up no. Reason being is that the power strength will only apply to the first shot in Peacemaker. Unless this has been recently fixed it's a useless mod for her, especially considering it would apply to the single weakest shot she produces since the damage multiplier would be at its lowest. Though if it's fixed, it's a good idea. To my knowledge Peacemaker is the only toggled ability which is broken with E. Conversion. Ember: She's got duration because without it WoF costs more ever since the toggled ability energy drain nerf. You need to keep around 100% duration to keep channeled abilities at their lowest cost. In Ember's case I need to slot duration because of Transient and Fleeting. And I have to disagree with Energy Conversion in general because of Zenurik existing, and my lack of needing to pick up energy. I think you put a little too much stock in how often you pick those up. Equinox: This starts to get into an excuse I'll use a few times here: I haven't put all of my alternate builds into Warframe Builder yet nor have I listed them here. The Equinox build linked is just for AOE bombing and long range CC. I don't have any of her augments yet and would have to buy them due to my current Syndicates. Mirage: I use a Prime Reach Orthos P on her and with all the melee combo mods her own power strength or illusion damage counts for very little. I could probably dump all of her power strength if it weren't for the fact that I want to keep Prism useful as well. Body Count + Blood Rush scale a LOT better than her augment does. The only time I use Mirage ever is for Orthos P or the Simulor, and in both cases the builds for the weapons are much more important than the build for Mirage, provided that you have duration. Nekros: WF fucked that one up, I'll update it tomorrow probably, obviously I'm not running a R0 Aura. Otherwise that build is exactly what I use now, just with higher level mods. I'm not worried about his build currently because I doubt turning Desecrate into a toggle is the only thing they'll do to him when he gets primed in two months. Nova: Extra strength is for both Null Star and Anti-Matter Drop. Nobody gives it credit but Voice and I have a really good time charging up Anti-Matter with a Redeemer and hitting for 2 million damage. I didn't know damage could go that high in this game. Otherwise, that forma setup also needs to work for Speed Nova which I run a lot more often. Again, not put into the builder yet. Rhino: Again, that's only one build, and in this case it's my solo build for Void/Derelict only, it just so happened to be the one that required the most capacity so I counted forma for it instead of the cheaper ones. It's got no range because obviously I won't buff anyone else, Roar is only for me in that case, which also explains the duration. Iron Skin is a simple matter of cast it while standing in front of a laser to get ridiculous armor scaling on it. And generally I use melee for that build, so Stomp doesn't need to travel far, it just has to hit hard. I do have the Iron Shrapnel augment, but I don't use it because of the laser trick, that Iron Skin will never break unless you face tank a Juggernaut, and even then, I have my doubts it would. But yeah, I do have two other proper team builds for him. I'll pick up an Energy Conversion but the damage difference we're talking about is going far into the realm of overkill, even in Sorties, and I think the extra flex in my builds should be put to use modding for other abilities. The Nekros thing with armor is pretty cool though, once he's been primed I'll work out what I'm doing for him. I'll be working on updating that list with alternate builds as well, but I prioritized the builds I use most often/cost the most to put together to ensure I could fit everything without having to go back and forma again. Energy drain is calculated as (2-eff)/(dur) BEFORE the 75% efficiency cap (strangely enough) so Streamline+Fleeting actually minimizes your energy drain ((2-1.9)/.4=0.25, which is efficiency cap) so you don't need to stack duration IF you run those two without Blind Rage. 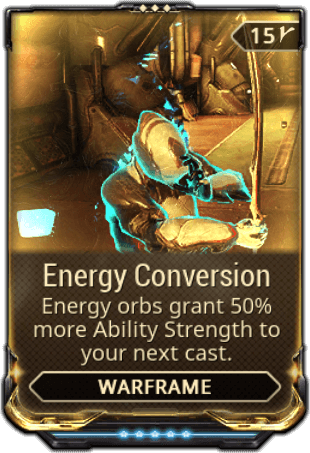 Energy Conversion snapshotted with Mesa last I tested but that was before her changes. Either way, if you're going to keep a toggled ability up then Conversion is active once you get the first orb and then for the rest of the mission. I think that it's worth it when you're saving two mod slots. Understood on the rest of your builds (particularly Rhino, that's more or less exactly what I'd run if I was laser glitching solo). I run extra strength AND Antimatter Absorb on my Nova build but I rarely see people using anything other than MPrime with her. 2 million is pennies though, need to get those 20 billion red crits with Resonance Banshee. Added one more build before I'm going to bed, just because it's the one I actually use the most for Valkyr currently. I had predicted her Hysteria nerf a few months ago and put something new together before it happened. I doubt there's anything groundbreaking about what I did, but it's still a lot more fun. Can still pop into Hysteria for healing, but that's all it's good for now. I cast resurrect on this thread. Queued up two mastery ranks in a row, tomorrow is 20. I didn't realize that junctions counted for 1k mastery each, I was about one weapon away and was able to reach 1,000,000 points tonight luckily.